Plant: Acrocarpous (Vitt 1988), scattered or tufted. Dark green to yellow-green, often blackish below. Stems 2-14 cm tall, simple, but occasionally a little branched. Rhizoids papillose. Leaf: When dry, leaves somewhat contorted. When moist, leaves squarrose. Leaves 2-3.6 mm long, triangular-lanceolate, and with a sheathing base. Margins plane or sometimes recurved at mid-leaf and serrate for most of its length. Costa ends before the apex or is almost percurrent and is narrow (less than 1/5 width of leaf at base). Leaf Cells: Upper and median leaf cells about 15 µm wide, rectangular to hexagonal. Basal laminal cells elongate and somewhat hyaline. The costa in X-S has small, thick-walls except for the ventral and dorsal layers. Leaf cells are very large and easy to see with a hand lens. Three-ranked and widely spreading leaves with serrulate margins frequently distinguish this moss. The similar M. longiseta is synoicous and has smooth leaf margins (FNA 2014). Greenland; Canada: AB, BC, MB, NL, NT, NU, ON, QC, YT; USA: AK, CA, MI, MN, MT, NE, NJ, NY, OR, SD, VT; n Eurasia (FNA 2014). 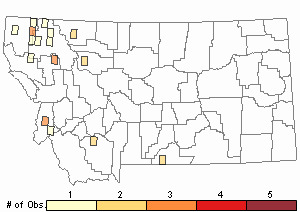 In Montana: Carbon, Flathead, Glacier, Lincoln, Ravalli, Sanders, and Teton Counties (Elliott 2016). Wet soil and peat in fens and bogs (Elliott 2016), soil in wet woods. Dioicous. Male plants have perigonia in terminal discoid heads. Seta is 4-10 cm long. Capsules are 2.8-5.5 mm long (with neck). Elliott, J.C. and A.K. Pipp. 2018. 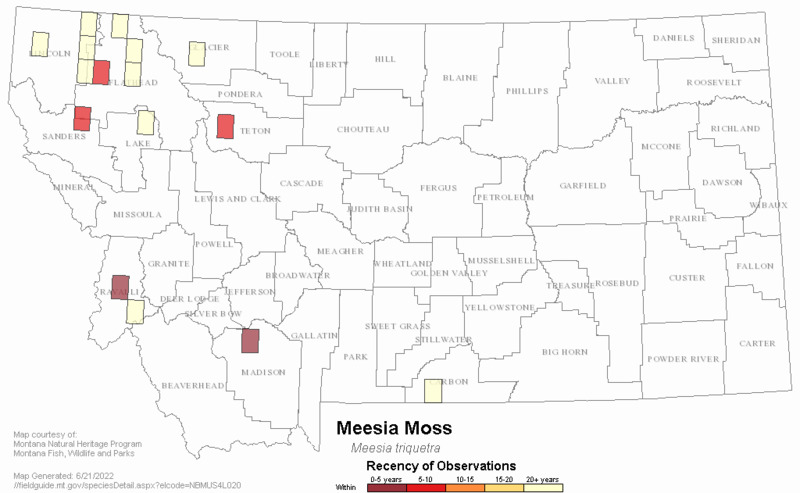 A Checklist of Montana Mosses (1880-2018). December 20th. Montana Natural Heritage Program, Helena, Montana. 73 pp. Flora of North America Editorial Committee, eds. 2014. Flora of North America North of Mexico. Volume 28. Bryophytes: Mosses, Part 2. Oxford University Press, Inc., NY. xxi + 702 pp. Vitt, D. J. Marsh, and R. Bovey. 1988. Mosses, Lichens & Ferns of Northwest North America. Seattle, WA: University of Washington Press. 296 p.
Lawton, E. 1971. Keys for the Identification of the Mosses on the Pacific Northwest. Reprinted from 'Moss Flora of the Pacific Northwest'. Published as Supplement No. 2 of the Journal of the Hattori Botanical Laboratory. Nichinan, Miyazaki, Japan. 66 pp. Lawton, E. 1971. Moss Flora of the Pacific Northwest. Hattori Botanical Laboratory. Japan: Yamabuki-cho, Shinjuku-ku, Tokyo. 362 pages plus appendices. 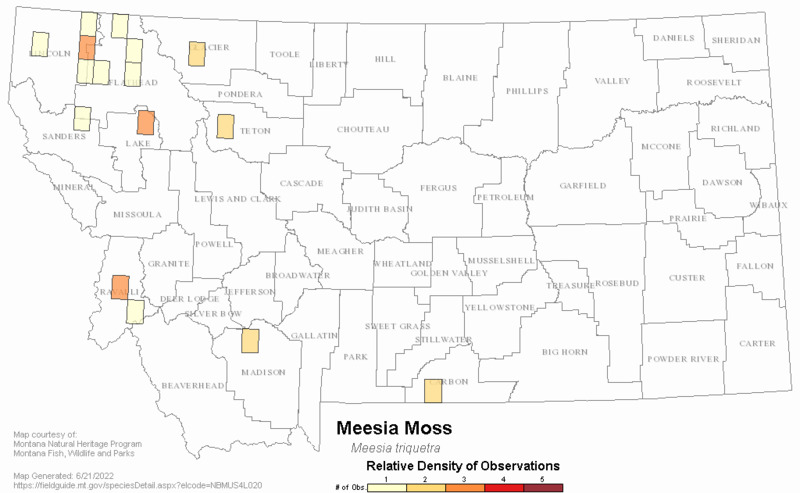 Web Search Engines for Articles on "Meesia Moss"